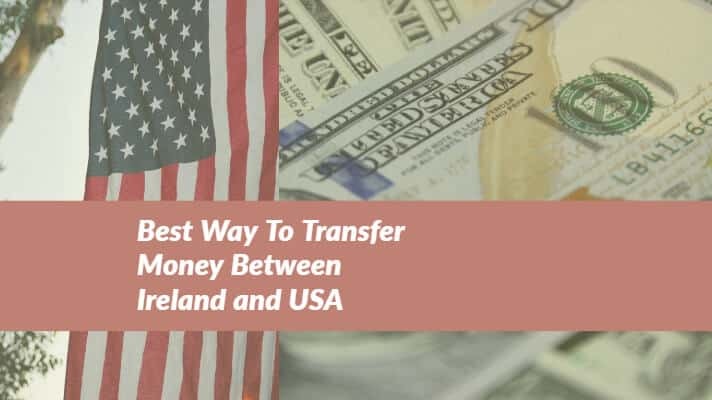 Best Way To Transfer Money Between Ireland and USA - While Saving Money! Best Way To Transfer Money Between Ireland and USA – While Saving Money! If you are looking to transfer money between Ireland and USA, I am here to help. One of the worst things people can do with money transfers is to use a bank to bank transfers. Trust me having transferred money from Australia to Ireland and to from Ireland to Canada using banks is a bad idea. But why? You might be saying. Well first of all banks charge 4-6+% on the exchange rate alone. Meaning before you even pay that crazy sending and receiving fees you are losing a few hundred dollars on the exchange rate alone. Okay, but what is the best way to transfer money between Ireland and USA? So now you know why I suggest not to use banks what are you supposed to do? My recommendation is OFX(previously known as USForex). They specialise in larger money transfers from $5000+, but they also do an amazing job in smaller amounts. Plus if you sign up here, you will also get free transfers for life over $1000! Yes for life! You get a dedicated broker this really helps if you want to talk to a real person. Another option would be Transferwise. They are fast and much cheaper than banks. But there is a large fee for larger transfers so if you are looking to transfer smaller amounts of money between Ireland and USA then this is a good option. Basically, the fee they charge is dependant on how much you send. So if you Transfer US$1000 it is only around $8 for a transfer. Compared to OFX which is Zero! How do I transfer money between Ireland and USA? In my previous post about the best way to send money to Ireland, I mention Currencyfair as I use them all the time. But they do not currently work from the US. You might be wondering, just how do I transfer the money? It does seem so alien sometimes not to use banks to send money between Ireland and USA. Don’t worry, once you do your first transfer you will be amazed why you ever used banks in the first place. Step 2: Tell OFX how much you want to transfer, what currency it and who you are sending it to. Step 3: Send your funds from your bank account. You can do this with a debit card or bank transfer(recommended). Step 4: Transfers to most countries takes 1-2 business days. You can track your transfer online or with their mobile app. Step 5: Pat yourself on the back because you have just saved a fortune sending money between Ireland and USA. Is it safe? YES! OFX has offices in Australia, Canada, Hong Kong, Singapore, New Zealand, the UK and the USA. Transferwise is similar but again just keep in mind that additional fee for sending money to or from the US. What if I have a question? The reason I love OFX is that you get a dedicated broker and guess what they are available 24 hours a day and 7 days a week. Is it really cheaper than using banks? I have been using them since 2013 and believe me it is so much cheaper than transferring money with banks. I just wish I had discovered the service earlier I would have saved even more money. What about other countries like Australia and Canada? Don’t worry with OFX you can send money to pretty much anywhere. You can read this guide for sending money from Australia to Ireland or for sending money from Canada here. Can i send money from Ireland to the USA? Yes indeed! It doesn’t matter which way you transfer the money. Register here with OFX and save yourself some money for the next time you are sending money between Ireland and USA. I hope you have enjoyed this guide for sending money between Ireland and USA. Be sure to comment below if it has saved you money. P.S Join my weekly dose of Irish to get all things Irish straight to your inbox.